The Great Pyramid and the Sphinx- if you read the popular tourist guides or take the popular tours that is all you likely will see of Giza. Indeed much of the mystery and secrets of the place can only be appreciated by those who have spent considerable time studying archaeology, be it conventional (the location of the important Old Kingdom tombs) or unconventional (weathering patterns of the Sphinx enclosure, exotic stone lathe work). To upset the monopoly of the two "Greats" here are a few thought provoking images, kind of a random walk around the Giza Plateau. 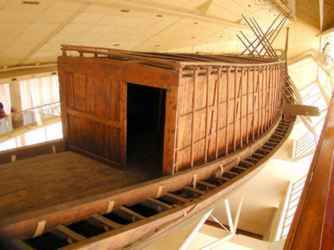 In a large pit alongside the Great Pyramid were found the disassembled parts of a beautiful 132 foot (40m) long Cedar boat. 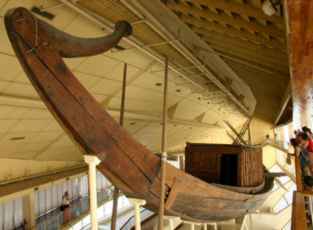 The boat has been restored and can be seen at Giza near where it was found. A second disassembled boat, of similar size, has been found adjacent to the first one. Photograph by Alex Lbh, CreativeCommons. The barge was most likely used to carry the body of the pharaoh the few miles downriver from Memphis. 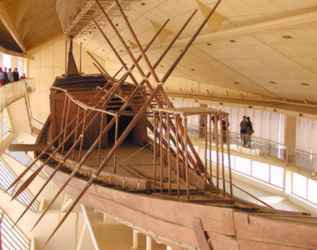 Although it was built for the ceremony it shows an advanced knowledge of boatbuilding and an efficient design. The restorers spent many years on the boat, it was difficult to decide where the parts fit. This photo shows the oars placed incorrectly - the 4 smaller oars should be in front of the boat, the 6 longer ones behind them where there is more deck space for the oarsmen. 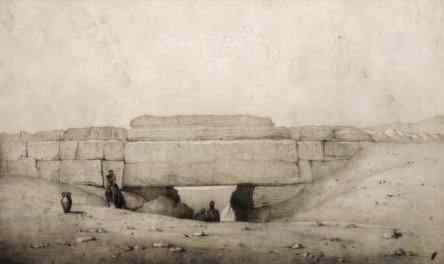 This and the above photograph are from EgyptArchive. The white building at center right is Cheops' Boat Museum. This old engraving poses several questions. It shows the area where the hillside was excavated near Chephren's Pyramid, the stone blocks that were removed were presumably used in that construction. The area seems to be as the builders left it, the raw stone showing the marks of processing that would be removed in the final finishing. The same things can be seen in the modern photo. The spaces between the stones are in the neighborhood of 10 inches (25 cm). It is thought that the Egyptians cut stone with saws similar to those used in woodcutting, a man on each end. Marks from saws are found on stonework. But these blocks were not cut with a saw. If they were, there would be a single cut between stones, with a width of something like 1/4 or 1/2 inch (1/2 to 1 cm). And why did they cut so deeply into the stone that was not to be removed? The cuts simply end in the foreground, there is no clearance for the workmen to use their saw. This small quarry is supposedly the same age as the Sphinx enclosure, which archeologists attribute to Chephren. Yet the heavy erosion of the enclosure cannot be seen at the quarry, an indication, perhaps, that the Sphinx is much older. The Gateway in the Southern Dike. The recently explored village of the Pyramid craftsmen has received a lot of attention in the conventional Egyptology media. These interesting discoveries document that the men who built the Pyramids were respected artisans with comfortable homes located South of the complex. The above gate, now called the "Wall of the Crow", has been pictured in these stories, giving the impression that it is a recent discovery. This 1842 engraving shows that it was known at that time. Little information on this structure is available. 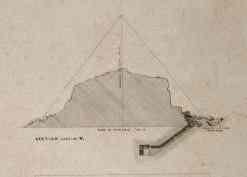 The artist calls it the "bridge in the southern dike", implying that it is part of a long wall, perhaps at one time enclosing the entire group of Pyramids and smaller tombs. It has been found to be 33 feet (10 meters) high and 39 feet (12 meters) thick. If it is a wall it certainly is an impressive one. But that should not surprise us by now. There are the remains of a causeway built of large limestone blocks running north-east from the plateau. The existing remains go down to about half the height of the plateau. This is how the stones were brought to the Gisa plateau. Piles of discarded stone scraps 100 yards (meters) long are found on the North and South slopes of the plateau. The total volume is a little less than 1/2 of that of the Great Pyramid. This shows a low percentage of wastage if these represent the scraps from all the Pyramids of Giza. An inventory of quarry marks from these scraps would offer an independent data set on the work at Gisa. It is also possible that remnants of previous temples were cleared from the site when Cheops first began work, and are now at the bottom of those piles. One can imagine, some time in the future, a crew of small, smart robots slowly excavating the millions of tons of pyramid debris, recording the position each piece is found, its' shape in three dimensions, and its' chemical composition precisely enough to locate its' source in the mountains across the Nile . . . and to trace each stone from the quarry to the pyramid. Technology to do this could be in the future of archaeology, giving great insight into how the pyramids were built. A substantial amount of black diorite stone chips were found in one of the scrap piles. 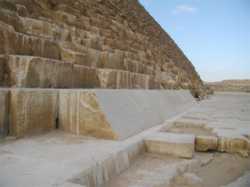 Since Diorite is not used in the known portions of the Pyramids, this find made Plazzi Smyth speculate that undiscovered chambers were constructed of that material. Diorite is very hard and difficult to work, the Egyptians used it for statues and hieroglyphs. It would be expected that such finely detailed work would not be done at a construction site, so the reason for the diorite chips is not known. The unopened tomb of Cheops' mother, Hetepheres, was found in 1925 in a 85 foot (25 meter) vertical shaft at Giza, east of Cheops' Pyramid, just north of the so called "Queens' Pyramids". There was no structure above it. This discovery is the source of most Old Kingdom royal grave goods now known, yet her sarcophagus was empty when it was found. 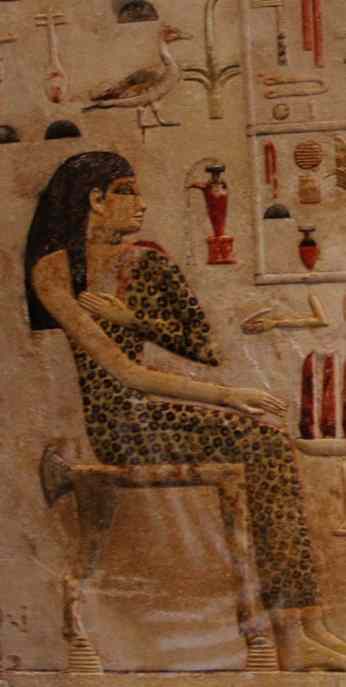 Cheops' daughter Neferetiabet, from her tomb at Giza. Stone plaque (stela) now at the Louvre, Paris. The leopard skin is a sign of the priesthood. Photograph by Einsamer Schutze, CreativeCommons. 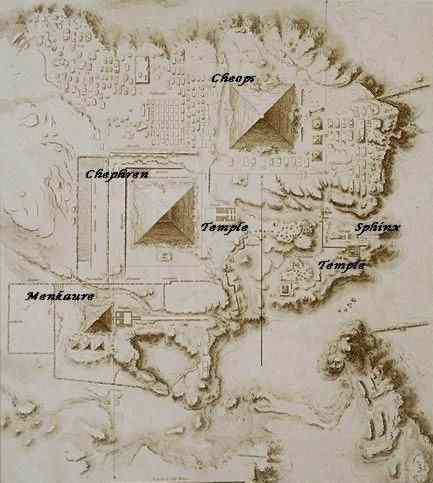 There are a number of small Pyramids at Giza, the larger are three to the East of Cheops' Pyramid and three to the South of Menkaure's. The above are cut away views of those beside Cheops. The function of these Pyramids is uncertain. Some appear to have been step-pyramids, but their small size appears to have attracted stone scavengers and most are severely damaged. Perhaps, as is often supposed, they were the tombs of Queens. All have chambers inside as if to house burials. But Cheops and Menkaure each have three and Chephren has only a very small one, which makes that explanation less likely, given human nature. If the Pyramids are seen as energy devices, amplifying the flow of cosmic energy from the dead Pharaoh/god, perhaps the small Pyramids located in rows at the East and South of the complex serve as some kind of buffers or stabilizers. 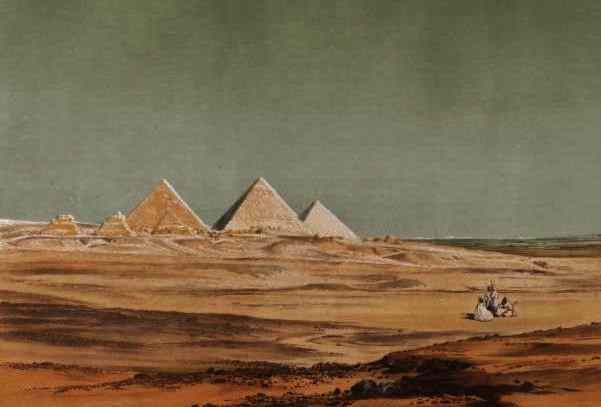 The Small Pyramids South of Menkaure's Pyramid. Cut away views of the small Pyramids South of Menkaure's Pyramid. 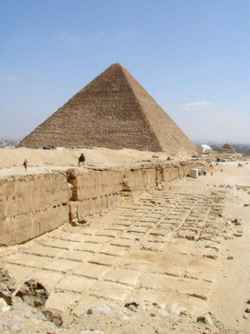 Only a few of the original fine Tura limestone casing stones remain of what once covered the Great Pyramid. 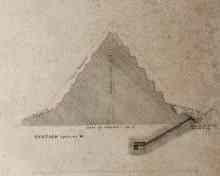 The story is that the stones were so large (about 15 tons), and so perfectly joined that the pyramid was nearly impregnable. Then an earthquake loosened some of them and allowed the valuable stone to more easily be gathered and transported for building projects in Cairo, in particular the Mosque of Sultan Hassan. The Mosque is a beautiful building, but one would wish that the Sultan had found another source for his stone. 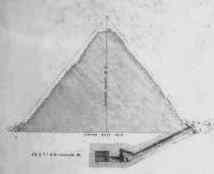 Other Pyramids have various small portions of their casing remaining, the Bent Pyramid has most of it. 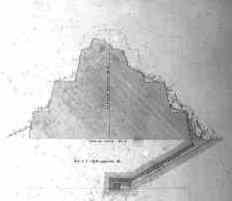 Those stones allow us to imagine what the finished Pyramids looked like, their angles, the size of their casing, and the precision of their construction (there is only a paper-thin crack between the casing stones). We can extrapolate most of the building from those few stones. And even more a reminder that our civilization is not as special as we often like to think it is. 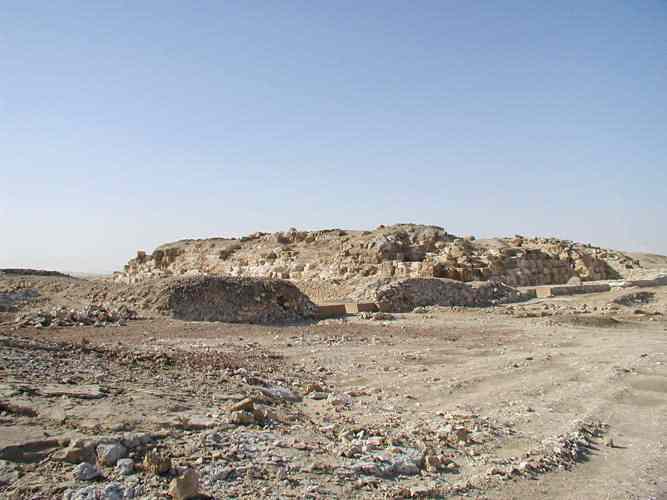 The remnants of the Pyramid of Djedefre at Abu Rawash. 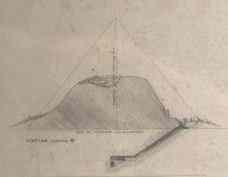 Five miles north of Gisa, in a part of the desert known as Abu-Rawash, Pharaoh Djedefre built his pyramid. 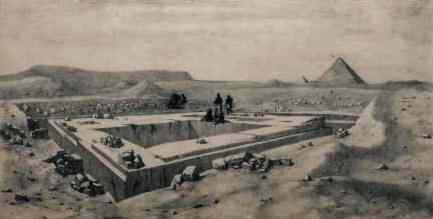 Djedefre had well known relatives, he ruled for eight years (estimated) between Khufu and Khafra (Cheops and Chephren), the builders of the world's greatest pyramids. Djedefre had ambition too, and he succeeded it seemed. 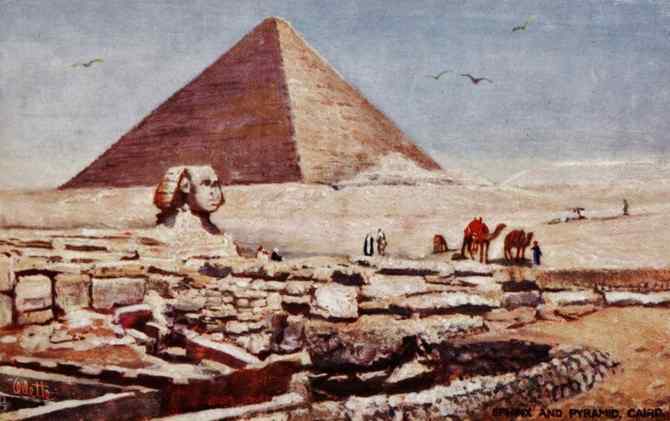 His reign was not as long and he contented himself with a pyramid smaller than Cheops, about the size of Menkaure's pyramid, which is third on the Gisa plateau. That would still make Djedefre's pyramid among the largest in the world, and would make Abu-Rawash an important tourist destination. Except that it's not there. Abu-Rawash was close to Cairo. 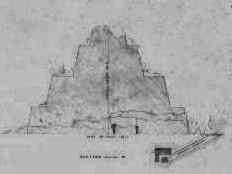 The fine limestone of the pyramid was much easier to steal than it would be to quarry, and so the great majority of Djedefre's pyramid has been stripped away for re-use over the last 2000 years. All that remains is a formless pile of stones. by Prisse de l'Avennes, 1878.